DURHAM, NC -- On a warm spring weekend, Durham's American Tobacco Campus is full of activity: Kids playing on the giant chess board, Duke students lazing in the hammock garden, happy dogs grabbing fallen morsels of pizza and sushi. And me, gearing up with a yellow hard hat, headlamp, and kneepads to go exploring 30 feet below all of it. Somewhere beneath Blackwell Street and the Durham Freeway runs a series of tunnels, which date back to the construction of the iconic brick buildings and docks in the tobacco district. In fact, the tunnels themselves are crafted of the same historic brick. The tunnels twist and turn through a maze of underground waterfalls, drain pipes, crawl spaces, and long brick corridors. In fact, the tunnels have been transformed into an actual labyrinth. True to Durham's spirit of urban renewal, these historic subterranean corridors have been "repurposed" into a hiding place for a geocache. Explorers who dare venture deeply enough will discover strange symbols and messages painted on the walls. At the end of the first tunnel, the message "Follow the Sun and Moon to symbols with meaning nearby." Deeper, mystic symbols, spirals, and runes are painted above diverging tunnels, guiding cachers and urban explorers. There's even a chandelier dangling at the end of the first main corridor. It's strange to imagine this entire scenario, like something from Labyrinth or The Maze Runner, is sitting right beneath the people eating sushi and pizza at the American Tobacco Campus in Durham. My only clue to the entrance was the tunnel runs beneath Bull River, so I spent an hour or so wandering up and down the American Tobacco Campus in search of a large entryway before finally giving up. Then, I contacted an expert of urban spelunking, a local explorer and geocacher named Vortexecho. We formed an adventure party of five underground pioneers: Daniel Manasse, Rachel Ruda, Thomas Wilkins, Vortexecho, and myself. 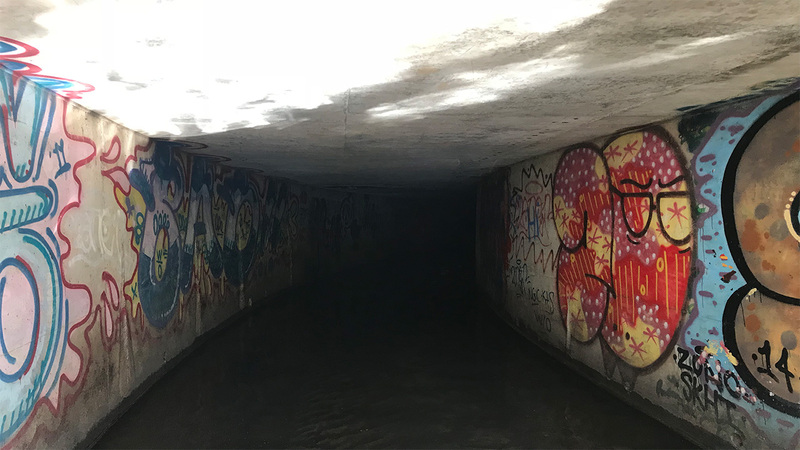 Across the Durham Freeway, we found a storm drain marked with the words "Trippy Tunnel" and an arrow pointing deep into the darkness. Vibrant graffiti colors the gray concrete walls like the wondrous boat scene from Willy Wonka. Icy water trickles ankle-deep, and headlamps illuminate the walls. The eclectic and fantastical artwork dies as suddenly as the sunlight; once the outside light can no longer reach, artists clearly decided to turn around as well. However, more daring explorers have left taglines and signatures deeper in the subterranean system -- usually, it seems, as breadcrumbs to help them find their way back out again. One artist left tiny clown faces, that greeted us no matter how deep into the underground we crawled. "None of this graffiti is mine," shares Vortexecho. Plenty of Durham-ites, it seems, have discovered this tunnel. "My paintings are really small, and all much deeper in the pipes." "We did install this, though," he says, grinning at the chandelier dangling inside the small brick room. "The new part of the storm drain," explains Vortexecho, "Is larger and easier to navigate. However, you can tell when we've entered the old segment when the walls turn brick." Black widows and spider crickets crawl alongside us through a series of long concrete pipes. We pause for a break into a chimney-like brick room with a drain above it. Outside, I see cars driving by. "We're under the freeway," remarks Manasse, another explorer. Eventually, we reach what I've been waiting for: The picturesque antique brick tunnels. The ground here is broken by decades of erosion. Instead of ankle-deep, the cold water jolts my kneecaps, then my thighs -- then, all the way to my hips. "Stay to the left side," warns Vortexecho. Manassee dips a water-level-testing stick into the pitch black water beside us. It drops about 4-feet. In the dark, we can't see where the cloudy water gets deeper; we just have to walk slowly and test our footing before we step forward. The brick hallway ends in a roaring waterfall, at least 8 feet tall. If we want to crawl into the historic brick tunnels beneath the American Tobacco Campus, we have to climb it. The antique section was clearly designed in a different era. Erosion has battered and broken some of the tunnels, causing tumultuous terrain. Rusted pipes curl through open rooms, and the water is deeper here. There is no more graffiti - clearly, very few explorers ever make it over the waterfall. But as we venture deeper, we find bricks that could be generations old. One brick has been plucked from its spot in the wall and enshrined above a grate. Its reddish surface is engraved with a delicate circular pattern. It strikes me as odd that such an artful piece of masonry was used so far beneath the streets, where so few people would ever see it. The corridors are constructed with strange dimensions, much like houses from the 1800's, with long, narrow passages and tall, thin doorways. At one point, the walls push together like a vice, leaving adventurers with their back to one wall and their nose-tip to another. I have to wonder: For what purpose was this spindly corridor created? The tunnels are undoubtedly more beautiful here. The brickwork is elegant -- I guess being underground is no excuse for being sloppy! The tunnels create archways of masonry with water flowing beneath, which is very different than modern storm drains, which are completely circular. It's strange to imagine that just above us, people eating sushi and pizza at the American Tobacco Campus in Durham. The American Tobacco Campus is the very image of urban renewal. After harboring America's largest tobacco and cigarette production for decades, it dried up when cigarettes went out of vogue. For years, those iconic brick warehouses and factories sat abandoned. Ivy and trees grew through busted and blacked out windows. Sometimes, the Durham police would utilize the vacant buildings for practicing tactical missions. Durham, however, is renowned for revitalizing old and historic buildings, rather than tearing them down. The city boasts a hotel and museum built inside what used to be a bank, where the vault is on display as part of the exhibit. Geer Street Garden is a restaurant growing inside an old service station. The resuscitated Durham Tobacco Campus is still a major part of Durham's culture and economy. Exploring the historic brick tunnels beneath this bustling cultural center, I feel more in touch with its past. I touch the brick wall, and I'm touching history. Vortexecho is passionate about seeing the world from underground - a secret and more intimate perspective that not everyone gets to see. Whether he's in caves, sinkholes, storm drains, or hidden tunnels, he says he's fascinated by the "adventure of the unknown." And why did he hide a cache beneath the American Tobacco Campus? "It seems to bring random people together. Most of the time those people end up being friends for life, or at least have a certain bond that cannot be forgotten." Our exhausted group surfaced to walk through the American Tobacco Campus, soaking wet, with yellow hardhats and headlamps still lit. We sat down beside the Bull River. A few passersby gave strange looks to us in our gear. We smiled. We're in on a secret. We know what history looks like from down below.